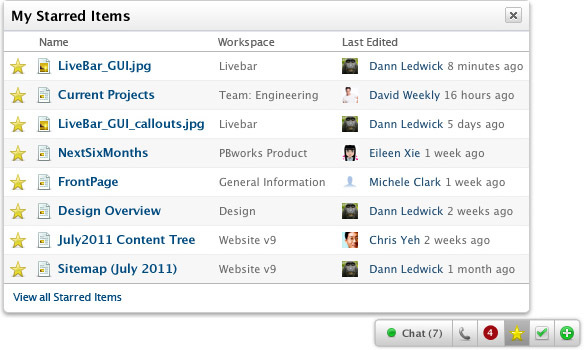 Ever since we launched our real-time collaboration features, our business products have featured the LiveBar in the lower-right corner of your screen. This nifty little tool let you chat with colleagues, trigger conference calls, and see the latest activity notifications, all without ever leaving your current screen. The LiveBar has been so successful that we’ve decided to expand it. Starting on Monday, the LiveBar will include three new features: Starred Items, Tasks, and Add an Item. These new features will make PBworks even easier and more powerful. Starred items have always been a useful feature for marking what’s important to you, but they had the disadvantage of requiring you to either A) navigate to the workspace containing the starred item, or B) access the starred items list from your Dashboard. Either way, it took many extra clicks to get to the item you needed. Enter Starred Items on the LiveBar. From any screen, you can now click on the yellow star in the LiveBar to see a list of your most recent starred items, and it takes just one more click to view a complete list on your Dashboard. Tasks are also an integral part of the product. But until now, if you wanted to see your full task list (across all your workspaces), you needed to return to the Dashboard view. With the new LiveBar, all you have to do is click on the Tasks symbol (the checkbox) and you’ll see a list of your upcoming tasks. As with Starred Items, you can click through to the Dashboard for a complete list. Finally, one of the most important things about collaboration is being able to add information quickly. 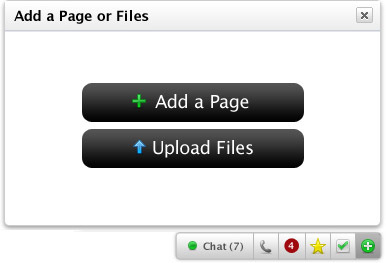 The new Add Items feature lets you add new wiki pages or upload files from any screen. Just click the add symbol and select your desired action. If you’re on a particular workspace, we’ll default to uploading to that workspace, but we’ll give you the chance to select any workspace and any folder as the location of the new page or uploaded file. The improved LiveBar will be rolling out on the night of Monday, September 19. Check it out, and leave comments on this post with your reactions! Great improvement. Looking forward to using it on Monday! That is excellent. Well done guys! I am not seeing this on my wiki…..is it a premium feature? Sorry, I should have been clearer. This feature is only available on business products, which are all paid.